We often take it for granted that our textiles can be thrown in the washing machine but this semester I found out how much more complicated it is to wash historic textiles. Wet or aqueous cleaning is a conservation treatment that uses water and/or additives (i.e. detergents, chelating agents) to clean an artifact. and this semester our class wet cleaned two different textiles – the first white and the second polychrome. 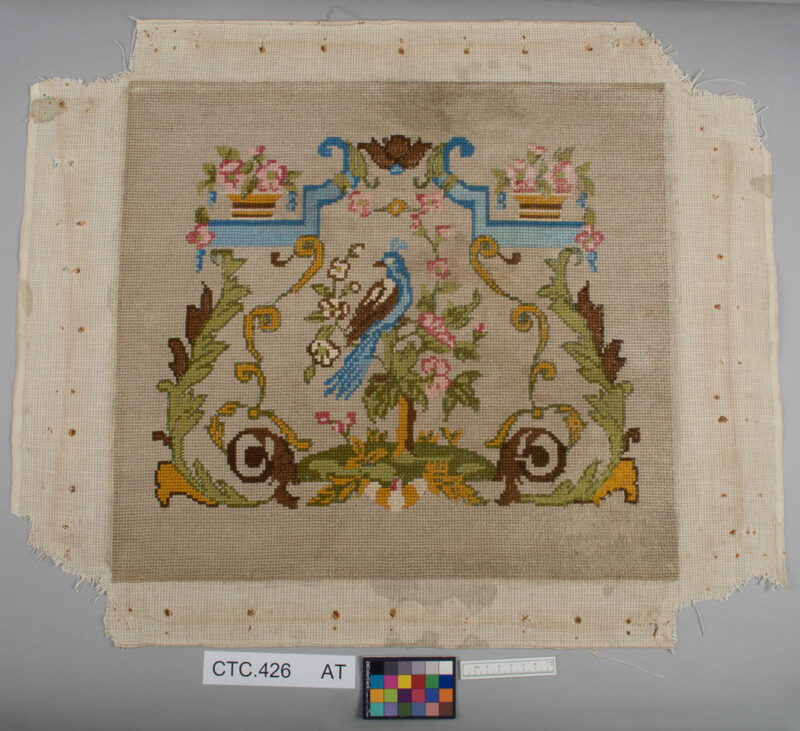 Based on the artifact’s stability, composition, and significance a conservator makes the decision whether a textile should be cleaned and if it is physically capable of withstanding a wet cleaning. The hazards that washing can pose include swelling of the fibers, shrinkage, mechanical damage from increased weight when wet, and bleeding of dyes. 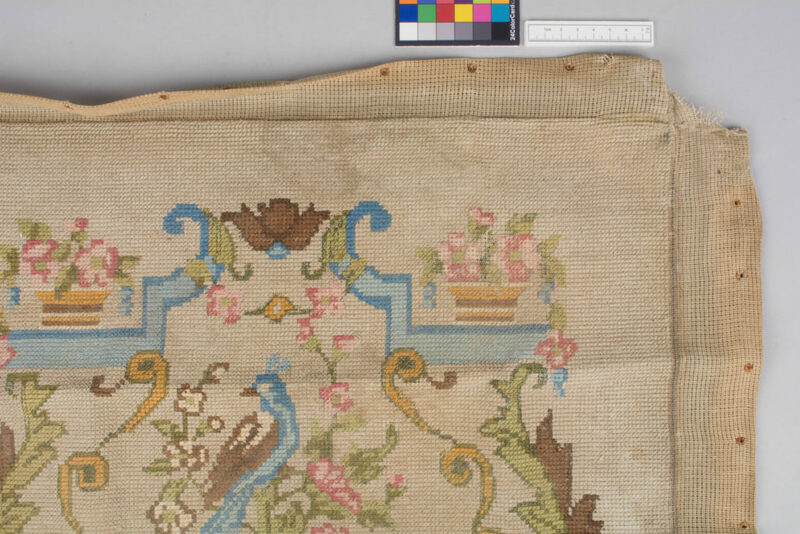 Embroidered Canvas Before Conservation Treatment © University of Glasgow, 2018. 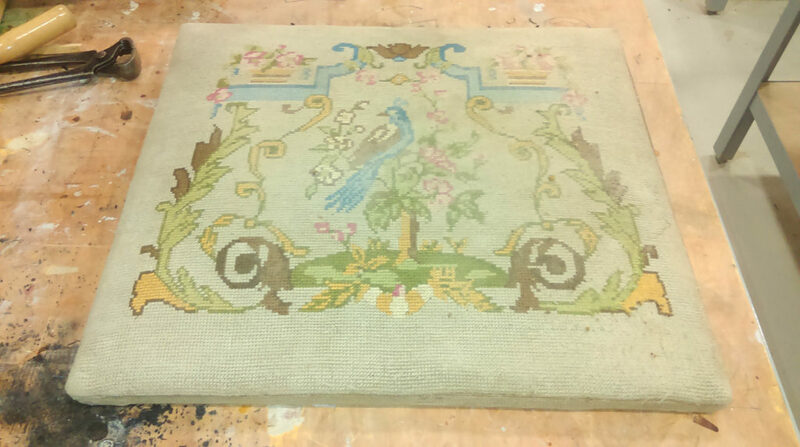 When I approached the conservation treatment of a polychrome embroidered canvas there were several factors that I had to consider before undertaking wet cleaning. The embroidery on the stool before conservation © University of Glasgow, 2018. Showing the seat after removal from the stool © University of Glasgow, 2018. Fiber identification under a microscope informed me that the canvas was made of cotton and the embroidery threads were mercerized cotton. Showing corrosion around tack holes © University of Glasgow, 2018. Fortunately, the object was structurally stable and would be able to withstand immersion in water and the mechanical action of sponging during a wet cleaning. There was minor abrasion in some areas and losses in the embroidery threads, but these did not compromise the stability of the textile. Before I could wash the embroidered canvas I had to perform washfastness tests on the dyed embroidery threads to ensure that dyes were wash fast and would not ‘bleed’ during wet cleaning. 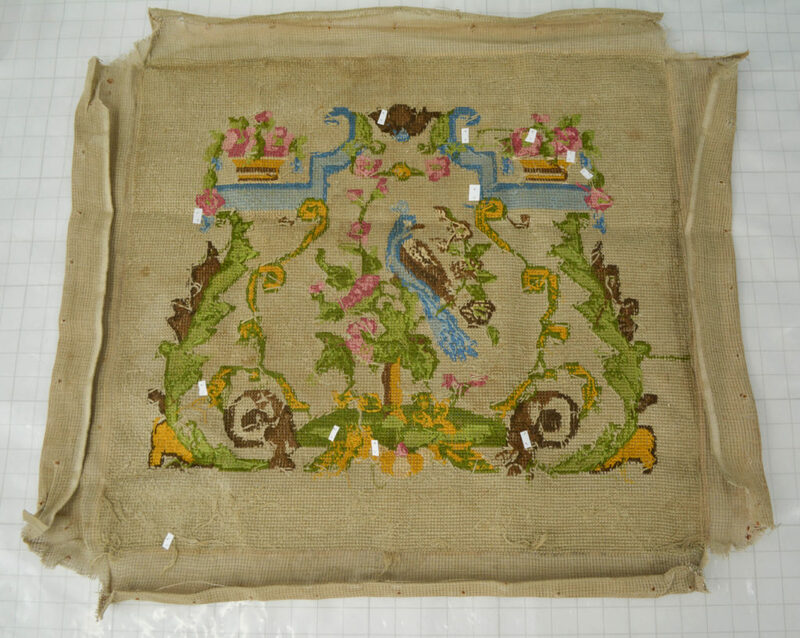 Small samples of the different embroidery thread colors were taken and placed on a white blotter paper, and a small amount of wash bath solution was formulated. Several drops of the wash bath solution were placed on each thread sample and the sample was covered to keep the samples wet for 1.5 hours; this would simulate an actual wet cleaning on a small scale. 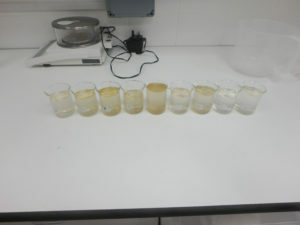 Afterward, the samples were allowed to dry. Throughout the test, the samples were checked for any dye bleed (during “washing” and while drying) but indications were that all my dyes were washfast. Washfastness Test on Back of Embroidered Canvas (white flags indicate sample areas) © University of Glasgow, 2018. Wet Cleaning: I washed the artifact in three successive baths to remove the soiling before it was rinsed several times to ensure that no detergent remained. The textile was sponged in the baths to increase foam formation; foam helps remove soiling from the textile. 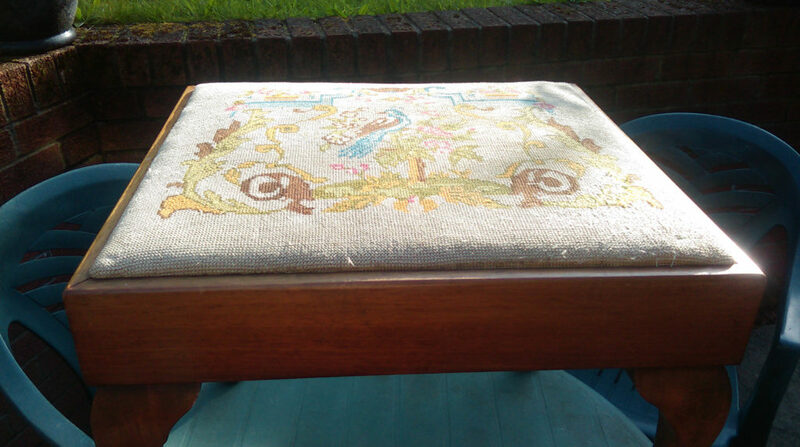 After washing and rinsing, the embroidered canvas was blotted with some cloths to remove excess water and then dried using a fan and hair-dryer, without heat. 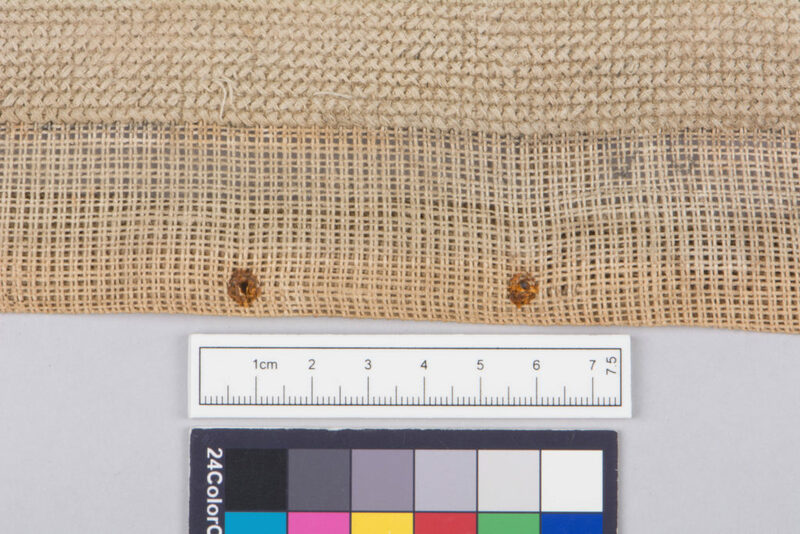 To prevent shrinkage during drying the textile was pinned to its original dimensions, marked on a board, while it was drying. The pins were moved frequently to prevent holes in the artifact from the pins. When the textile was completely dry the pins were removed. The dyes did not bleed during the entire washing and drying process. Washing the textile © University of Glasgow, 2018. Wash beakers showing soiling released into the washbath © University of Glasgow, 2018. Washing our own clothes seems simple because we place them in a washing machine with some purchased pre-made detergent and press the start button. Conservation wet cleaning involves understanding the composition of the artifact, its stability, and significance before a detergent can be chosen and a wash bath solution formulated. Drying also requires constant monitoring of an artifact to ensure that dyes don’t bleed and dimensional changes do not occur. Sometimes it is nice to just press a button, so appreciate the work that has been done for you the next time you wash clothing; and remember it could be much more complicated. 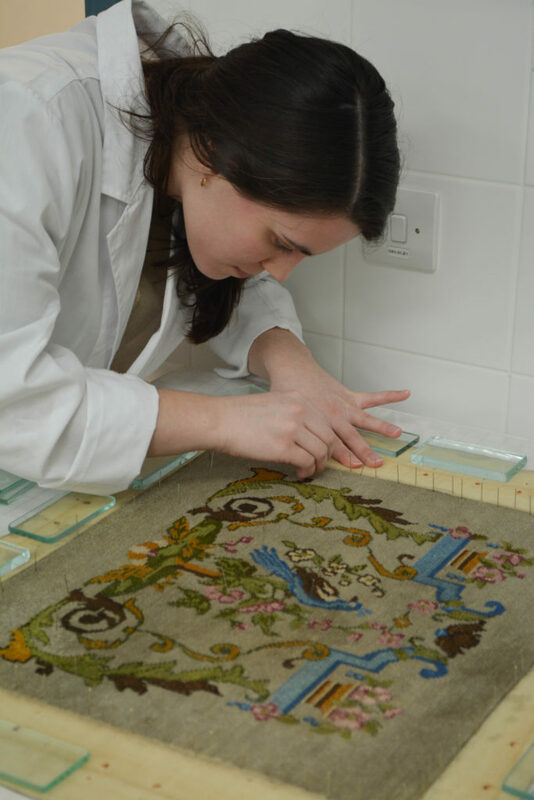 Embroidered Canvas Before Conservation Treatment© University of Glasgow, 2018. Ágnes Tímár-Balázsy and Dinah Eastop, Chemical Principles of Textile Conservation (Oxford: Butterworth-Heinemann, 1998), 194. 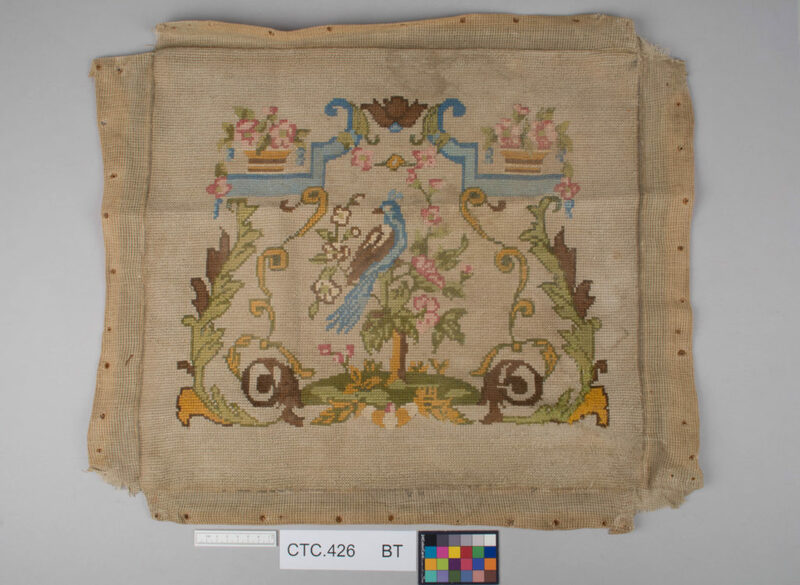 Mary M. Brooks and Dinah Eastop, “Matter Out of Place: Paradigms for Analyzing Textile Cleaning,” Journal of the American Institute for Conservation 45, no. 3 (2006): 171 – 172. Tímár-Balázsy and Eastop, Chemical Principles of Textile Conservation, 194. Kathryn Gill, “Example of cross-section diagrams to document changes to upholstery layers before and after conservation treatment,” in Upholstery Conservation: Principles and Practice, eds. Kathryn Gill and Dinah Eastop, (Boston, MA; Oxford: Butterworth-Heinemann, 2001), 181 – 185. 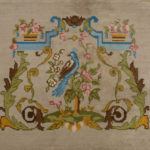 Gay Swift, The Batsford Encyclopaedia of Embroidery Techniques, (London: B.T. Batsford Ltd, 1984), 37 – 39. Tímár-Balázsy and Eastop, Chemical Principles of Textile Conservation, 25 – 29. Jane Lewis and Dinah Eastop. “Mixtures of Anionic and Non-Ionic Surfactants for Wet-Cleaning Historic Textiles: A Preliminary Evaluation with Standard Soiled Wool and Cotton Test Fabrics.” The Conservator 25, no. 1 (2001): 73-89. Nicola Gentle, “Documentation and conservation of carriage trimming: the treatment of a nineteenth-century carriage interior,” in Upholstery Conservation: Principles and Practice, eds. Kathryn Gill and Dinah Eastop, (Boston, MA; Oxford: Butterworth-Heinemann, 2001), 84 – 85. Tímár-Balázsy and Eastop, Chemical Principles of Textile Conservation, 28 – 29. Tímár-Balázsy and Eastop, Chemical Principles of Textile Conservation, 208. Good heavens, Mary Brooks and Dinah Eastop, its ages since I heard about them and it was lovely to hear they are still at it, books flying off the printer. Please Sarah give them our regards.